Sengex has partnered with Patriot One Technologies, and its award winning PATSCAN-CMR solution, to directly address the very real and growing Active Threat phenomena which has become a significant force for shaping research in weapons detection. Since the 1970’s many parts of the world have experienced ongoing increases in acts of international terrorism, with increasing numbers of domestic Active Shooter incidents occurring with disturbing frequency. In response, Patriot One has developed the basis for portable devices to assist military and civilian security personnel in the detection of concealed weapons. The technology, which is intended to be placed in entryways and other key locations, utilizes radio wave emissions that safely target, identify and notify of concealed threat potential through software recognition of specific wavelength patterns. Early warning is the key to effective deployment of timely countermeasures, and Patriot One’s PATSCAN-CMR provides an automated alert system capable of covertly screening moving individuals for on-body concealed weapons (handguns, knives, grenades, explosive vests, etc.). 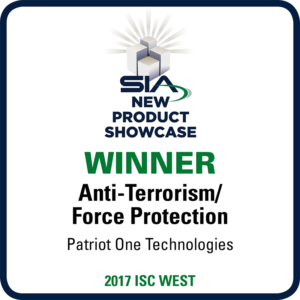 PATSCAN-CMR was the recipient of the Anti-Terrorism Force Protection Award at 2017 ISC West. The Anti-Terrorism Force Protection Award recognizes innovations for use in security applications. PATSCAN-CMR is the world’s most advanced technology for covert screening and detection of concealed weapons. PATSCAN-CMR identifies threats by database comparison of known weapons profiles, and by detection of concealed irregular object mass. Unlike millimeter wave units in use currently, the PATSCAN-CMR is far less expensive, easily concealed, and utilizes a single scan for detection, as compared to the numerous scans required by large, expensive and manned static installations. PATSCAN-CMR screens individuals in real time as they pass though the PATSCAN-CMR detection field in access points, halls and entryways. Installation can be covert or overt from any direction (e.g., sides, directly above or below), subject to need and structural considerations. Eliminates institutional metal detector style look and feel. 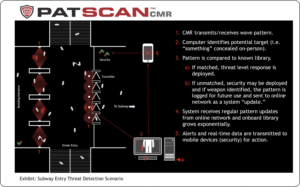 PATSCAN-CMR patent-pending Cognitive Microwave Radar employs a network-wide ability to “learn” and adapt to new threats as “signature” patterns are identified. Pattern updates are transmitted network-wide offering an ever increasing signature library. PATSCAN-CMR offers performance accuracy which significantly reduces personnel needs required for bag checks and secondary screening as security is primarily deployed against identified threats only. PATSCAN-CMR provides stand off capability and guidelines to increase first responder reaction times through immediate action integrated directly to access controls. Users manage activities from a desktop computer, mobile application, or as a dedicated alarm for localized alerts. To learn more about PATSCAN-CMR, contact your Sengex representative at our contact page. Small enough for covert hall and doorway installations. No subject compliance required. System acquires results on moving targets. Doesn’t require line of sight.